On this date in 1834, one day after overrunning the Alava village of Gamarra, Carlist General Tomás de Zumalacárregui had 118 of its defenders shot. We meet him on the march in 1834, adroitly reversing the grim royalist position in the First Carlist War — a liberal-vs.-conservative civil war that also mapped onto ethnicity, geography, and royal succession. On this occasion, he overwhelmed a contingent of liberals and Basques fighting for the child-queen Isabella II. 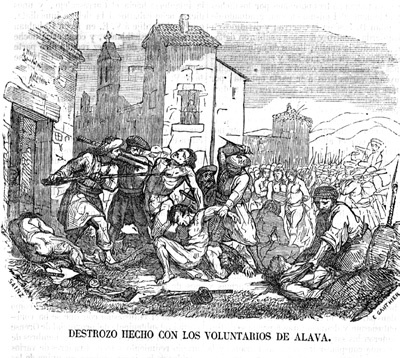 The survivors were taken prisoner and (despite objections from some of Zumalacárregui’s underlings) given a fusillade the next day in the neighboring town of Heredia. An English peer eventually brokered the Lord Eliot Convention, an arrangement by which both Carlists and Cristinos agreed to stop slaughtering prisoners and exchange them so that they could properly slaughter one another on the battlefield instead.